Radha-Krishna's ardour is well-known to devotees as well as to the not-so-devoted. Their love has a transcendental appeal that has spread across varying times, spaces, and cultures. 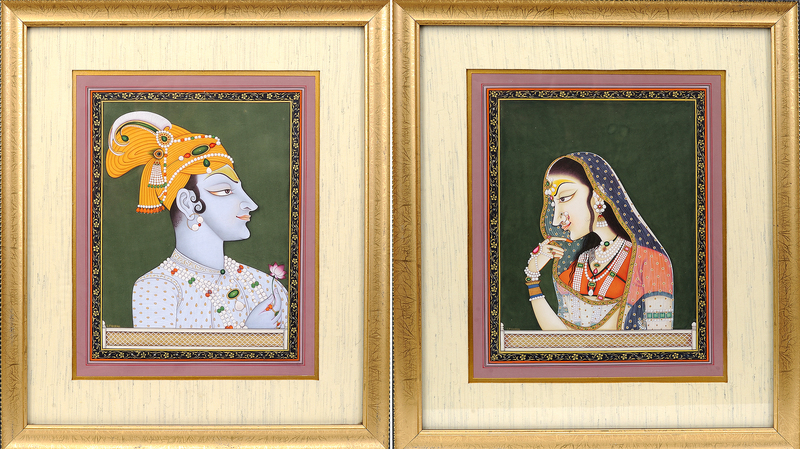 This superbly framed watercolour by Kailash Raj, India's most well-known contemporary artist, depicts Their respective profiles in twin portraitures. Given the size of each painting, the level of detail will fascinate you every time you gaze into it. So telling are Their respective composures of countenance. Krishna looks straight ahead at His Radha, His brow arched in admiration; while Radha prefers to look at the flower He is holding up to Her, Her gaze resting beneath His, so overcome is she by bashful reserve before Her Lover. As expressive as the emotional current flowing between them is, this is a watercolour of multifaceted beauty. Krishna's majestic turban, the colour of a field of marigolds in the Indian countryside, has been secured with strings of pearls. The miniscule rubies and emeralds that punctuate the pearls have been painted in with rich, irresistible colours. Krishna's skin has been given the colour of cool twilight, His fingers long and slender, His attire regal. Radha shields Her face with Her bootie-studded dupatta, Her tattooed and bejewelled hands holding it in place against Her flawless skin. Her shringar is elaborate, becoming Her great beauty. Her jet black tresses fall about Her frame, the slender curves of which are revealed rather than concealed by the translucent dupatta. Both have been given classically handsome features by the artist. Do not miss the frame painted around each profile. Characterised by soft pastels, gold and silver tendrils set off the beauty of the subject. Note how the royal green background is darker in the case of Radha, in harmony with Her fair complexion. Pristine marble railings in the respective foregrounds indicate that the two lovers are enjoying each other's company on a moonlit terrace.